"Danger!" is a TCG-exclusive archetype of DARK monsters that debuted in Cybernetic Horizon. The "Danger!" monsters are based on cryptids, animals of questionable existence, from around the world. You can reveal this card in your hand; your opponent randomly chooses 1 card from your entire hand, then you discard the chosen card. Then, if the discarded card was not [its own name], Special Summon 1 [its own name] from your hand, and if you do, draw 1 card. If this card is discarded: You can [...]. You can only use this effect of [its own name] once per turn. The strategy consists in the "Danger!" monsters revealing themselves in their owner's hand to activate their effects, then "hiding" in the hand again, making the opponent randomly discard a card from their opponent's hand. If they fail to "catch" the "Danger!" monster, the monster is Summoned and a card is drawn. If they do "catch" the "Danger!" monster, it triggers its discard effect, which varies from Special Summoning a "Danger!" monster from the Deck to destroying card on the field. As such, the competitive potential of the Deck lies in the fact that activating a "Danger!" monster's effect will only rarely be a disadvantage to their user. Summoning several "Danger!" monsters in a turn isn't difficult and they can quickly perform an OTK, especially when combined with other archetypes, such as "Dark World" and "Fabled", whose effects activate when they are discarded. As their effects work only in the hand or in the Graveyard, they're weak to commonly-used cards such as "Abyss Dweller", the often Side Decked card "Shadow-Imprisoning Mirror" and less-seen cards like "Debunk" or "Skull Meister". In the same way, the archetype is vulnerable to cards like "Macro Cosmos" and "Dimensional Fissure" banishing their monsters. Because the monsters have to reveal themselves in the hand, cards like "Ceremonial Bell" and "Respect Play" can seriously disrupt this deck's strategy, because they simply reveal the monsters so their owner can no longer reveal them by their own effect. Also because the Deck revolves around Special Summoning, cards such as "Vanity's Fiend and "Vanity's Ruler can also impede the deck by preventing you from Special Summoning. The Deck is, to some extent, luck-based. If the random card discarded by the opponent is not a "Danger!" 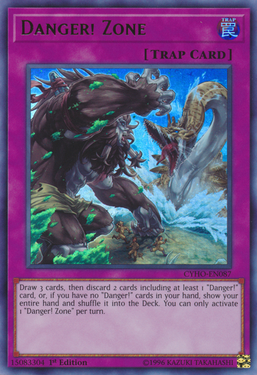 monster, this can hamper the Deck's overall consistency; however, this can be aleviated by including "Dark World" and/or "Fabled" monsters in the Deck. Also, losing a Hand trap could be a problem, so the Deck cannot rely on them as consistently as other strategies.